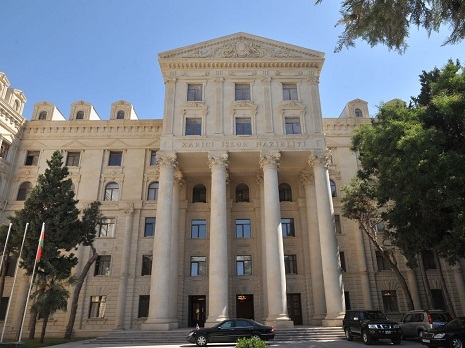 Azerbaijan’s Foreign Ministry has commented on the possible meeting of Azerbaijani Foreign Minister Elmar Mammadyarov with his Armenian counterpart Zohrab Mnatsakanyan. “The information about the date and venue of the next meeting, according to the agreement reached between the foreign ministers of Azerbaijan and Armenia and the OSCE Minsk Group co-chairs, will be provided when the time comes,” Azerbaijani Foreign Ministry’s spokeswoman Leyla Abdullayeva told Trend Jan. 9. It was earlier reported that a joint statement by the heads of delegations of the OSCE Minsk Group co-chair countries, Azerbaijan, and Armenia following a session during the OSCE Ministerial Council Meeting in Milan on Dec. 6 read that the sides agreed to meet in early 2019 under the auspices of the OSCE Minsk Group co-chairs. Besides, Mammadyarov also said that negotiations on Nagorno-Karabakh conflict’s settlement in the current format will continue in January.